Brownies are often among the first recipes a beginning baker attempts. In fact, many of us baked our first proud batch of brownies as children. And, just as likely, we've puzzled for years over why such a "simple" recipe can have such variable results: too dry, too blah, too underbaked in the center. And there are other questions as well: What makes a brownie "cakelike," "fudgy," or "chewy"? Why do some brownie recipes call for a mere two ounces of chocolate and others for as much as six ounces? What effects can different types of sugar create? Is there any way to remove brownies neatly from their pan? If these questions have you frowning over brownies, cheer up! We've assembled the best tips and secrets to make your next batch-and every batch-a success. The classic brownie consists of just a few ingredients: butter, sugar, chocolate, eggs, and flour. 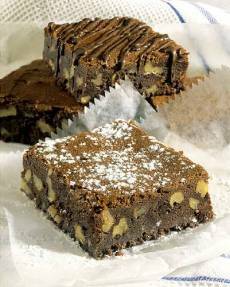 FUDGY BROWNIES (which purists often claim are the only real brownies) have a minimum of flour–about half a cup–and no leavening such as baking powder at all. Melting the butter rather than creaming it with sugar yields a denser, fudgier outcome. Unsweetened chocolate is the standard, with a full cup of sugar required to balance its bitterness. Either granulated or brown sugar may be used; substitute one for the other in equal proportions. The deeper the color of the sugar, though, the more pronounced the molasses flavor. It's all a matter of personal taste. CAKELIKE BROWNIES are really … well, little cakes! They contain less butter and more flour than fudgy brownies, as well as a bit of baking powder to make them softer and lighter. Often the softened butter is creamed with the sugar rather than melted with the chocolate. (Creaming incorporates air into the mixture, which causes the brownies to rise higher.) Many cakelike recipes also call for a bit of milk to add tenderness. CHEWY BROWNIES usually get their texture from two factors: an extra egg (or even two) and a combination of different types of chocolate. Of all the chocolate types, unsweetened chocolate has the highest proportion of starches, which create a stiffer-textured brownie. Semisweet chocolate produces a creamier texture. Put the two together, often with a few tablespoons of cocoa powder to round out the flavor and thicken the texture, and you get a rich, satisfyingly chewy result. BLONDIES are really butterscotch bars, made with brown sugar, butter, and eggs (and usually nuts as well), but no chocolate. Typically, blondies have a cakelike texture. Brownies aren't a low-fat treat. Besides the butter–as much as 8 ounces, or one full stick, per batch–there's the cocoa butter in the chocolate itself. For a calorie-trimming alternative, look for recipes that use unsweetened cocoa powder instead of bar chocolate, or substitute 3 tablespoons of cocoa powder, plus 1 tablespoon butter, for each ounce of unsweetened chocolate. ("Dutch-process" cocoa has the smoothest, mildest, and richest flavor.) Most cocoa powder has only 10 percent to 12 percent fat, compared to unsweetened bar chocolate's 50 percent to 55 percent. And many tasters can't tell the difference! First, use the pan size specified in the recipe-usually but not always 8 inches square. Baking in a too-large pan will yield thin, dry bars that may taste fine but won't resemble true brownies. Baking in a too-small pan may result in brownies with undercooked centers. Be sure to select a light-colored, shiny pan, which will conduct heat evenly. Glass or dark-colored pans can cause the edges to overbake or even burn. Always grease the pan thoroughly with shortening, softened butter, or cooking spray. (Do this even if the recipe doesn't specify.) After greasing the pan, many bakers like to line it with pieces of parchment paper or aluminum foil that have been cut larger than the size of the pan so that the edges hang over the sides like a sling. Thoroughly grease the lining. After the brownies have baked and cooled, the lining may be lifted out of the pan and inverted on a platter. Gently peel away the foil or paper, then cut the brownies into squares. Brownies can also be baked very successfully in a well-greased mini-muffin tin, which eliminates the problem of cutting into squares. Most brownie recipes begin with melting butter and chocolate together. The safest way to do this is in a double boiler or any small pan placed over a pot of gently simmering water. If you're an experienced baker, you can place the butter and chocolate directly in a saucepan over a low flame. Be sure to stir the mixture constantly. Butter and chocolate may also be melted together in a microwave oven on medium power, opening the oven and stirring the mixture every 20 to 30 seconds. Overmixing the ingredients can cause brownies to turn out tough or for a thin crust to form on top. Mix wet and dry ingredients just long enough to blend them, taking special care not to overbeat after the eggs are added. To improve the texture of brownies, place the unbaked batter (in the prepared pan) in the refrigerator for several hours or even overnight. How Long to Bake Brownies? Experience is the best guide, but here are some general rules. For fudge-style brownies, remove the pan when the sides have shrunk slightly away from the edges of the pan. The center will still be slightly gooey, but will firm up during cooling. Cake-style brownies are done when a toothpick inserted into the center has a few moist crumbs attached to it. To prevent burning the bottoms of your brownies, place the pan on a preheated cookie sheet or pizza stone. Brownies will be easier to cut if you place the pan in the freezer for several minutes. Dip a sharp knife in hot water, wipe it dry, and move it across the pan in an up-and-down sawing motion. Pastry chef and chocolate expert Alice Medrich, who has written several books about baking with chocolate, swears by something she calls the "Steve ritual," after a friend who discovered the technique by accident. She bakes her brownies for a shorter time at a higher temperature (375 to 400 degrees), then placing the hot pan in ice water about ¾" deep. The sudden change in temperature produces a crisp crust and a soft, dense center. After you cut the brownies, either cover the pan tightly with aluminum foil or remove the brownies and place them in an airtight container. If they contain perishable ingredients such as cream cheese, place them in the refrigerator. At room temperature, they'll keep for three to four days; in the refrigerator, about five days. Freezing brownies may affect their texture, so it's best to take a few precautions. If the brownies have been cut into squares, wrap each square in plastic wrap, then in foil, and then place the wrapped squares in an airtight freezer bag. Alternatively, you can freeze the whole pan briefly-just long enough to harden the brownies. Then remove the brownie "block," wrap it tightly in plastic wrap, then in foil. Place the block into a large airtight freezer bag and freeze.